It turns out that the Galaxy Fold is a phone of firsts. 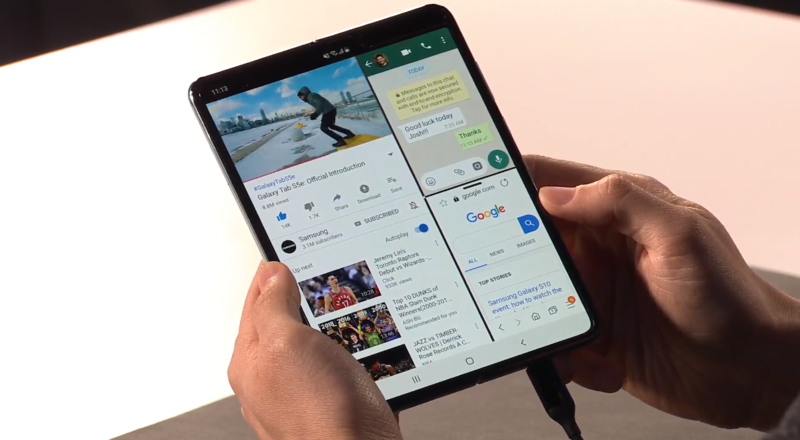 It’s Samsung’s first foldable device, it’s the first mass-market foldable phone, and it also seems to be the first device to use the company’s ultra-fast eUFS 3.0 storage — with read speeds roughly two times faster than the OnePlus 6T’s. Samsung announced version 3.0 of its Universal Flash Storage specification earlier this year, promising 2.9 GB/s of data bandwidth. Some hoped the technology would make its way to the Galaxy S10, but the S10 series ended up shipping with older UFS 2.1 storage. As @UniverseIce points out on Twitter, the Galaxy Fold appears to be the first device to use UFS 3.0, unless Samsung snuck the storage into another device without anyone noticing. The benchmark results in the video show sequential read speeds of 1,478 MB/s, and sequential writes of 383 MB/s. For comparison, I ran the same benchmark on my OnePlus 6T, which showed seq. read speeds of 715 MB/s and seq. write speeds of 202 MB/s. However, there wasn’t a major difference in random reads and writes. Perhaps Samsung decided to give the new storage a test run on the Galaxy Fold, before bringing it to the rest of the Galaxy lineup. Either way, the fantastic performance should give the people spending $2,000+ on the phone a bit more comfort.